We are delighted to announce that one of our partnership projects has been chosen to represent urban community gardens at this year’s prestigious RHS Malvern Spring Festival. Since 2015, the Ecocentre has provided two days support a week to Allens Cross Community Association in Northfield, to deliver a community growing space for the Trescott housing estate. People using the garden include those experiencing a range of social and health disadvantages – mental health problems, learning disabilities, and those not in education, employment or training. RHS Gold Medal winner Hannah Genders and her team invited Allens Cross Community Garden to be part of EGG – Eco, Green and Growing at the Spring Festival. Themed around growing food in the community, EGG will incorporate live music, talks on eco gardening as well as demonstrations such as willow weaving and interactive art. Allens Cross Community Garden will showcase how communities can grow together, transporting several of their compact container gardens and upcycled garden features to the Spring Festival. Volunteers from Allens Cross Community Garden and members of the Northfield Ecocentre team will also be on hand to talk about the project. 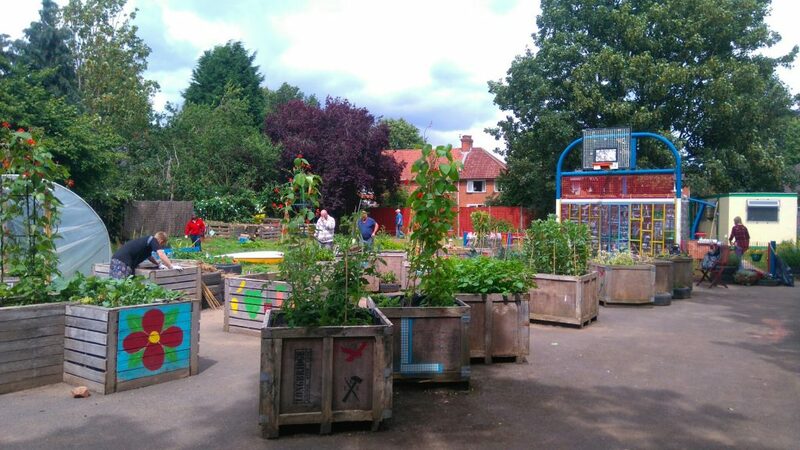 Allens Cross Community Garden started in 2015, transforming a disused playground and surrounding wasteland. The garden now has a bee hive and an associated education project ‘Bee Mindful’, polytunnel, greenhouses and mandala garden. They have 18 regular volunteers at the site. Last year 185kg of fruit and veg was harvested from the garden. This is equivalent to 2,313 meals or £1,109.34. In 2017, the community garden also received a Britain in Bloom Outstanding Award for its work. The RHS Malvern Spring Festival takes place from 10-13 May 2018 at the Three Counties Showground in Malvern. More information on the show can be found here.